The third EU Vocational Skills Week organized by the European Commission, in cooperation with the Austrian Presidency of the Council of the European Union from the 5 to 9 November congregated more than 350 participants who joined this edition to discuss about the future of Vocational Education and Training (VET). EfVET delegation included members of the Executive Team, Steering Committee and EfVET Members from different countries. 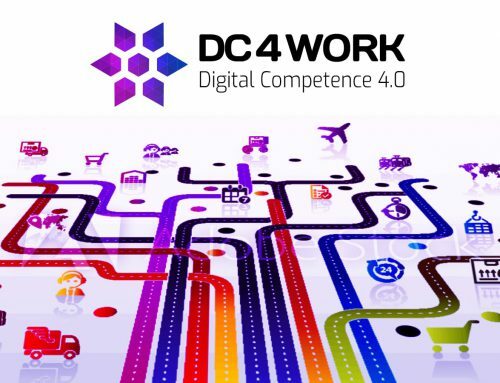 The fourth EU Vocational Skills Week will take place 14-18 October 2019 in Helsinki (Finland). EfVET is one of the supporters of the EU Vocational Skills Week since their first edition. 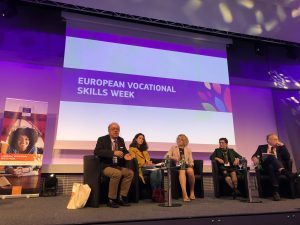 The aim of the EU Vocational Skills Week is to show that VET is a good/first choice, for young people and adults, leading to excellence in education, high-quality jobs and increased employability. 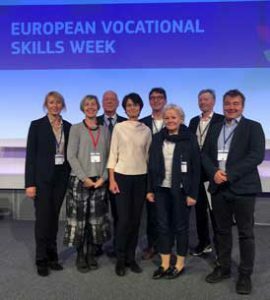 Even more, the EU Vocational Skills Week is actively contributing to the development of the New Skills Agenda for Europe. 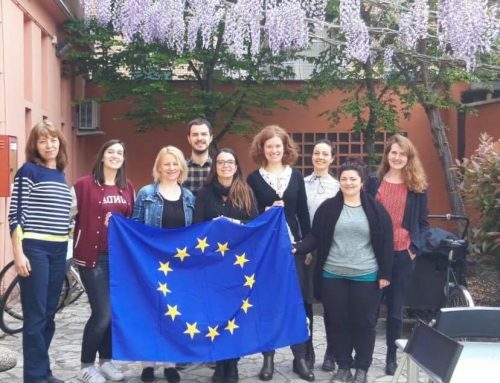 During the three days of the EU Vocational Skills Week in Vienna, EfVET representatives, stakeholders, experts and others from European Member States and beyond discussed and worked intensively on the further development of VET in Europe. Mr Tirati underlined that the challenges for VET in today’s labour market are huge as “VET playing a crucial role in the social and economic development of any country”. At the same time, VET providers are obliged to aspire to excellence and inclusion, two complementary values which every institution is forced to respect and put into practice. 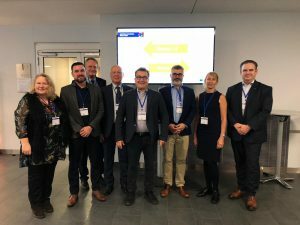 In order to give a response to the main VET challenges EfVET has launched a new approach with EfVET Thematic Teams which are focused on the following topics school-enterprises, social inclusion, VET internationalization, learning mobility, technology enabled learning, joint European qualifications frameworks and technologies and industry 4.0. Furthermore, EfVET is already f cooperation with industries via Blueprints – Sector Skills Alliances (Automotive, Maritime Technology, Space-geo information, Textile, clothing, leather and footwear and tourism). "The 1st principle of the European Pillar of #SocialRights is on skills. Our Skills Agenda & #EUbudget proposals are further proof of our commitment to not only talk about social Europe, but make it real!" 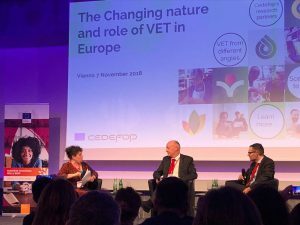 Jens Bjornavold (CEDEFOP project coordinator) and Jorg Markowitch (CEDEFOP researcher) presented the main findings of CEDEFOP study on “The changing nature and role of VET in Europe. 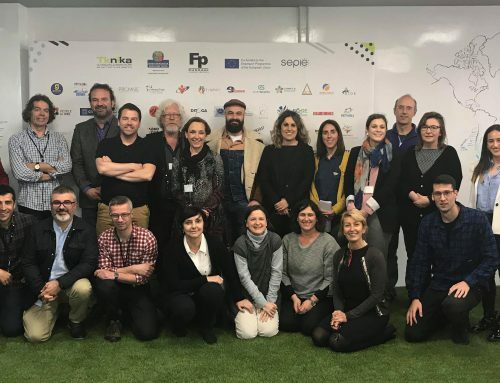 ” The European agency CEDEFOP has been supported by a big research consortium and expert from all 30 countries covered by the study. Borders between VET and GE have become blurred. Work-based and practice-based approaches are now more frequent in school -based VET, but also in general and higher education. Transversal skills integrated in VET curricula. For example, Finland has reduced the number of occupational standards and also in Austria, Germany occupational standards have been merged. Mr Majumdar added that Europe and the rest of the world face similar challenges and Networking and Partnership are the new Strategic Resources. 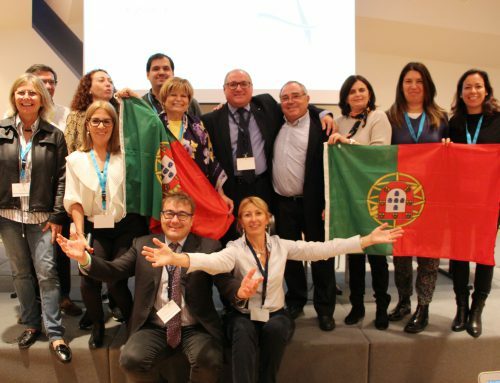 The EAfA celebrates its fifth anniversary celebrating the achievements but also looking the future perspectives. The second day was opened by a panel discussion to react to the presentation of the different scenarios and the challenges/opportunities ahead. This panel discussion gathered the views from Margarida segard (EVBB), Cesare Onestini (European Training Foundation), Loukas Zahilas (Cedefop), Frederic Piccavet (European Apprentecesihip Network), Robert Plummer (BusinessEurope) and Agnes Roman (ETUC). Mr. Onestini, European Training Foundation (ETF) said that “the scenarios show end possibilities, but the staring points of VET systems are different. Also, Ms Margarida Segard from EVBB emphasized that “cooperation with companies and the economy is essential to bring Distinctive VET forward”. CEDEFOP expert, Mr. Zahilas said that “the scenarios are more like trends and the future there will not be one model, but rather elements from the scenarios will be adapted even in parts of the same country”. The VET Excellence Awards 2018 ceremony took place on 9th November. 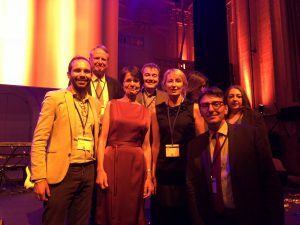 Commissioner Marianne Thyssen said “We want to bring great stories, characters and experiences in the field of VET to people across Europe and beyond. Whatever the results are tomorrow, for me all of you are winners!”. The EU Vocational Skills Week is not as you can keep organizing your events or activities until the end of 2018, be part of the EU Vocational Skills history and discover your talent.